Disc 1: On the "+" Menu for "Treehouse of Horror XIII" highlight the Play Episode button and press your up button to reveal a "KK" on the back of Kang's chair. Press your Enter button for an animatic of Lisa being possessed in the opening of "Treehouse of Horror 7". 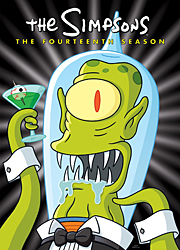 Disc 1: On the "+" Menu for "Treehouse of Horror XIII" highlight the Play Episode button and press your up button to reveal a "KK" on the back of Kang's chair, then press your Right button to highlight a "KK" on the back of Kodos' chair. Press your Enter button for an animatic of the entire "Treehouse of Horror XIII" episode. Disc 1: On the "+" Menu for "Bart vs. Lisa vs. The Third Grade" highlight the Play Episode button and press your up button to reveal a "KK" on the back of Kodos' chair. Press your Enter button for a deleted scene. Disc 1: On the "+" Menu for "Bart vs. Lisa vs. The Third Grade" highlight the Play Episode button and press your up button to reveal a "KK" on the back of Kang's chair. Press your Enter button for a deleted scene. Disc 2: On the "+" Menu for "The Dad Who Knew Too Little" highlight the Play Episode button and press your up button to reveal a "KK" on the back of Kodos' chair. Press your Enter button for a deleted scene. Disc 2: On the "+" Menu for "Barting Over" highlight the Play Episode button and press your up button to reveal a "KK" on the back of Klang's chair. Press your Enter button for an overview of various press items celebrating The Simpson's 300th episode. Disc 3: On the "+" Menu for "A Star is Born-Again" highlight the Play Episode button and press your up button to reveal a "KK" on the back of Kodos' chair. Press your Enter button for a deleted scene. Disc 3: On the "+" Menu for "C.E.D'Oh!" highlight the Play Episode button and press your up button to reveal a "KK" on the back of Kang's chair. Press your Enter button for a deleted scene. Disc 3: On the "+" Menu for "'Scuse Me While I Miss the Sky" highlight the Play Episode button and press your up button to reveal a "KK" on the back of Kodos' chair. Press your Enter button for a deleted scene. Disc 3: On the "+" Menu for "Three Gays of the Condo" highlight the Play Episode button and press your up button to reveal a "KK" on the back of Kang's chair. Press your Enter button for a deleted scene. Disc 4: On the "+" Menu for "Old Yeller-Belly" highlight the Play Episode button and press your up button to reveal a "KK" on the back of Kodos' chair. Press your Enter button for a deleted scene. Disc 4: On the "+" Menu for "Brake My Wife, Please" highlight the Play Episode button and press your up button to reveal a "KK" on the back of Kang's chair. Press your Enter button for a deleted scene. Disc 4: On the "+" Menu for "The Bart of War" highlight the Play Episode button and press your up button to reveal a "KK" on the back of Kodos' chair. Press your Enter button for a deleted scene.